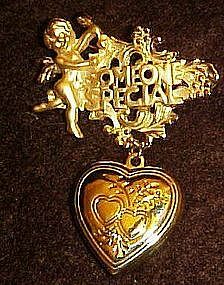 Pretty gold tone angel pin says "Someone Special". From it, hangs a heart locket that opens to reveal your two pictures you choose. Marked Giovanni, Measures overall 2" long. Locket could easily be removed to wear on a chain and the pin could be worn seperate. Excellent condition.